Durian season has finally arrived again in Singapore. The season runs between the months of June and September. 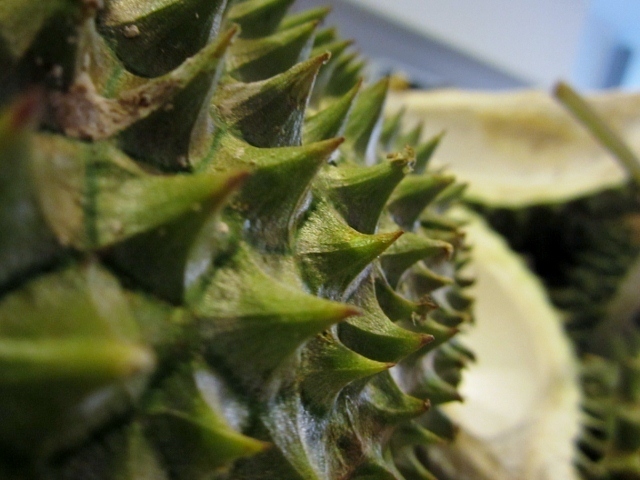 Widely known in Southeast Asia as the “King of Fruits”, the Durian comes in various sizes, has a unique pungent odour, and a shell covered in spikes (Can you guess why the Singapore Esplanade Theatre is nicknamed "The Durian"?) The fruit can grow as large as 30 centimetres long and 15 centimetres in diameter, and it typically weighs one to three kilograms . It looks pretty formidable; like a heavily armoured fruit, but once the outer husk is broken the fruit can easily be pushed open to reveal the flesh covered seeds inside. The smell has been described many ways, from sewer, toilet and other non flattering adjectives. Like Blue Cheese; it is definitely an acquired taste and isn't for everyone. Those who try it once can be repulsed by it but if you're game to give it a few tries, you might come to enjoy it. The flesh is wrapped around the seeds and is custard like in texture. It is pretty creamy and depending on the species; can have a very interesting taste. Its kinda like a bit of sulphur mixed in with a hint of ammonia! Some even describe it as being a bit alcoholic. In fact there is a variety named "XO' for it's alcohol like taste. All in all, a very unique fruit which is to be tried at least once. To give you an idea; the price ranges from about S$8/kg to S$15 - $20/kg, depending on the quality, region and popularity of the Durian. This is pretty amazing considering that the edible parts of the Durian only account for 20-30% of the total weight, so essentially the bulk of your dollar goes to paying for the inedible shell and pulp. 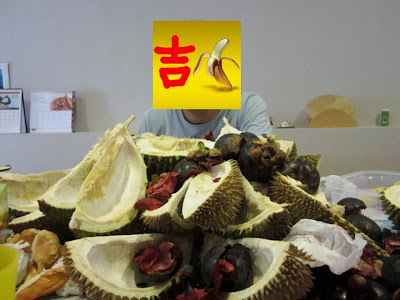 Our friend ordered the Durian from Malaysia, originally she said she was going to order 15, but it turned out she ordered about 30!!! 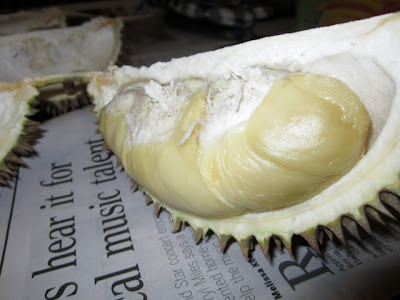 Check out the variety we tried at the Durian Feast! 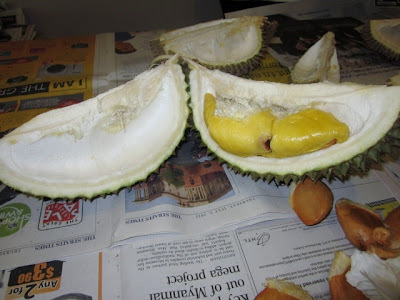 Golden Phoenix Durian - "Lower grade"; quite creamy/sweet, not as pungent, pale yellow. very pungent smell/taste, less creamy but has a bitter sweet taste. Definitely our preference. Mao Shang Wang. Pretty good. Durian is quite a "heaty" fruit. What is meant by this? Culturally, "heaty" food is believed to slightly increase body temperature and cause things like ulcers in the mouth. 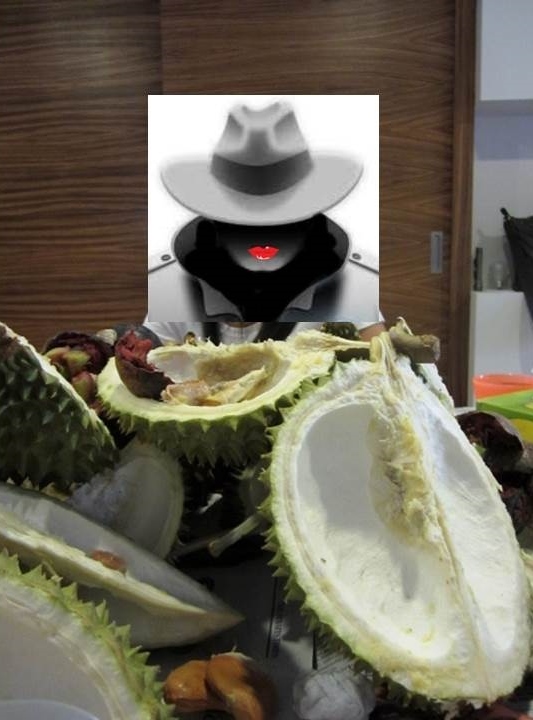 You would need to eat a serious amount of Durian for this to happen though! So if the Durian is the "King of Fruits", there must be a "Queen of Fruits" right? Correct. 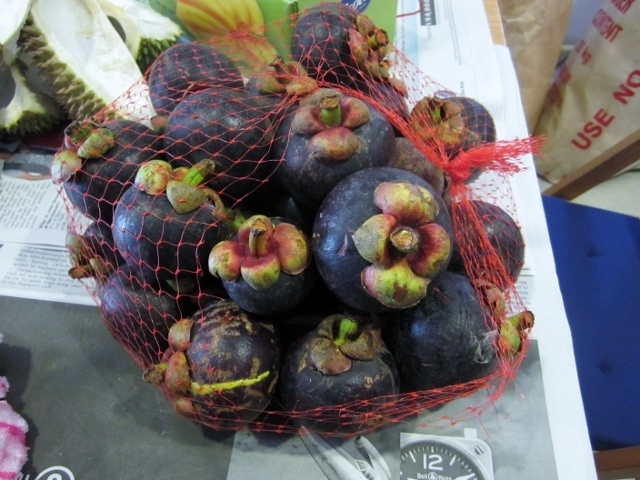 The Queen of Fruits is considered to be Mangosteen. Its a round purple coloured fruit; kinda like a purple Passionfruit. Inside it has thick purple pulp (be careful, it can stain!) and hidden in the centre of this pulp is sweet/sour white flesh. 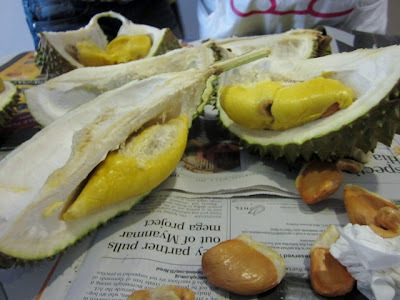 It is very refreshing and is said to "cool" the heatiness of the Durian. For this reason the 2 fruits go hand in hand as King and Queen. Check out some more photos from the Durian Feast! The pile of shells got a lot bigger than this! From this angle; it looks like we're going to be buried in Durian shells! 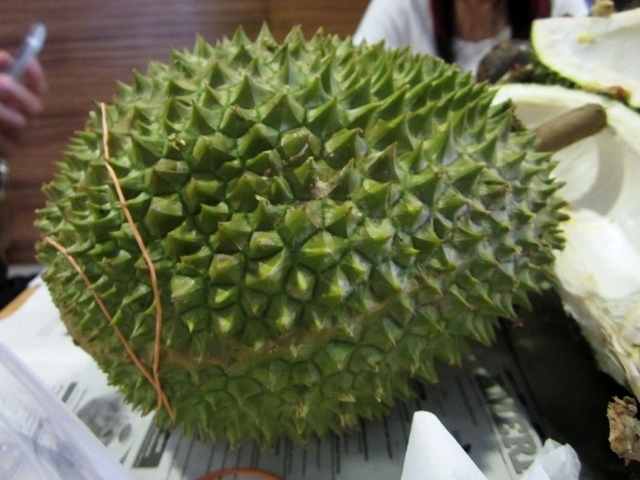 I have been in Singapore during Durian season, but have to confess I haven't tried them. Not usually a wimp when it comes to strong smelling and tasting food, my only excuse is that I had a stomach bug when I was in Singapore. Maybe next time I'll give it a go. If you block out the smell, does that improve the taste experience, or not? It is really something you have to try to know what its like :) I'm not sure how you would plan to block out the smell; nose plugs or holding your nose. I don't think it would work as the taste can be quite strong so will simply flow from taste bugs to smell LOL. Doesn't sting like Wasabi though. Maybe next time you're in Singapore, start slow with a Durian puff/pancake and then move onto ice cream to get a bit of an idea. But hey, experiences are all about first impressions so just dive on in and eat the fresh fruit. I love mangosteens but I'm afraid durian does nothing for me.